Proper wedding dress storage will keep your dream gown in immaculate condition for years to come. Use the right tools and techniques and your gown can be stored beautifully for years. It's not enough to have your dress cleaned; it will also need to be preserved. Many dry cleaners offer this service, and some places even specialize in wedding dress preservation. Preservervation pecialists know how to clean the dress and preserve the fabric so it can stay in storage for decades if need be. Some women choose to preserve their own gowns, and this task ismade easier by the availability of preservation kits ad supplies online. Proper storage also includes packing the dress carefully in a box or a bag designed to keep the gown from incurring any damage from the elements or insects. Storing the dress correctly is just as important as having it preserved to keep it beautiful and free from damage. Make sure your dress is professionally cleaned. Just because your dress looked clean to you when you took it off doesn't mean this is the case. Further examination may unearth dirt and stains. These stains can darken and become permanent if not dealt with quickly. Your dry cleaner or wedding dress preservation specialist will know exactly what to look for and which chemicals and solvents work best for particular fabric. Never store your wedding dress in plastic. When plastic breaks down it emits chemicals that can react with your dress and cause permanent damage. There's no such thing as completely acid-free cardboard. If you're packing your wedding dress in a cardboard box, even if it's touted as being acid-free, you'll have to change the box every five years or so. Before packaging your wedding dress, wrap it in acid-free tissue paper for extra protection. Don't use colored tissue paper as it can eventually bleed onto the fabric. Store your dress is a cool, dry place. Basements aren't ideal for wedding dress storage because they're damp and can encourage mold. Storing the dress where it's exposed to heat or sunlight will cause it to turn yellow. Your best bet is to store the dress in a closet. Don't use a wire hanger to hang your dress. Not only can it rust, but it can cause the fabric to tear. If you must hang your dress, hang it by the loops. Keep in mind that if a heavy dress hangs for too long, the fabric can tear under the weight of it all. If you'll be storing your dress in a wooden box, especially a cedar box, make sure there are layers of fabric or acid-free tissue paper between the wood and the dress. The acid in the wood will permanently stain the dress. Every now and then you should remove your wedding dress from storage and hang it in the fresh air. This will allow the fabric to breathe, making it less susceptible to mildew. If you have chosen to tackle the job yourself, you'll need storage supplies. From preservation kits to garment bags, there is an option that will fit your budget and your preferences. One option is to pass this important job on to professionals if possible. Send your gown to Wedding Gown Preservation and receive your garment back in perfect storage. 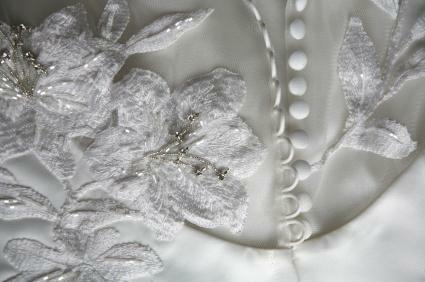 Other stores like Wedding Gown Preservation Company allow you to select the grade of preservation you'd like. Both these companies send you packaging and labels. You send the gown to the company and they process it, repackage it and send it back to you. You'll have your favorite dress forever. If a less permanent storage option appeals to you, then buy special storage boxes. Buy an acid free storage box from Foster-Stephens. You can have the box personalized with the your name or a special message. They send packing instructions, wraps and a box with a large viewing window. Heritage Garment Preservation has boxes with no windows, but the containers do offer protection from dust and fingerprints. With these kinds of boxes, you can open your gown at any time to examine it. Proper preservation and storage will allow you to wear the dress again at a special anniversary event, pass it on to a daughter, or save it as an heirloon or special memory of the wedding. Saving your dress will protect your investment and save sweet memories. When the big day is over and the honeymoon is behind you, don't forget these wedding dress tips for storing your dress.